Our Specialist Private Client Criminal Defence team of highly experienced and qualified Solicitors and Barristers are available to advise and represent you on a Fixed Fee if you are facing an investigation or prosecution for any criminal offence. We are frequently appointed to represent and defend regulated professionals, business owners, public figures and high-net worth individuals that find themselves charged or being investigated for a criminal allegation. If you or a family member is due to appear in the Police Station, Magistrates’ Court or Crown Court, contact our Top Rated Private Criminal Defence Lawyers on 0345 222 9955 or complete our Contact Form at the bottom of this page and a member of our team will explain how we can assist in defending your reputation and safeguarding your liberty. Our clients choose us because we offer a comprehensive privately funded service that goes miles beyond what one could expect from a legal aid or low-end, quick turnaround law firm. The attention to detail and professionalism of our lawyers gives our clients the best chance possible of avoiding prosecution and to maximise their chances of being found not guilty at trial. Why Instruct Kang & Co Criminal Defence Solicitors? Clients choose us to represent them for their criminal law case because of our excellent track record and understanding approach towards their case, we understand and appreciate the impact of a conviction on your professional and personal life. We have an outstanding reputation in the industry and regularly receive positive feedback from our clients, regardless of how serious or minor the offence, our team of skilled criminal law solicitors are well trained, and highly motivated to protect your rights. If you instruct us to defend your case, we will explain everything to you about your prosecution and will discuss your bespoke defence strategy with you in detail and will advise you on all the possible outcomes. Skilled Solicitors: Our Criminal Defence Solicitors have an excellent record in successfully defending criminal charges in the Magistrates’ and Crown Court. In addition to having our own in-house barristers and advocates, we also have strong working relationships with very senior members of the Bar (including QCs) and other leading legal experts in their field who can form part of your legal defence team. We are a Leading National Private Client Criminal Defence Law Firm, that frequently receives 5-star reviews and positive feedback from satisfied clients on Trustpilot, Google Reviews and Yell. We are also recognised as a Best Rated law firm in Birmingham and Milton Keynes. This reputation has been developed by providing unrivalled expertise, practical advice, communication and court advocacy. If you choose to appoint us to defend your case, we guarantee that you will be provided with the best legal representation available, which in turn will provide you with the best chance of a successful result at Court. If you are facing a criminal investigation or prosecution, you should seek out the very best lawyers to defend your case, so that you have the best chance of a successful outcome. Our solicitors and barristers are highly experienced and recognised nationally for successfully defending a significant number of high-profile criminal prosecutions throughout England and Wales. As a specialist private funded criminal defence law firm, we represent clients that are in a financial position to fund their cases privately, as a result our clients do not qualify for Public Funding (Legal Aid) and for that reason we do not undertake any work on Legal Aid. 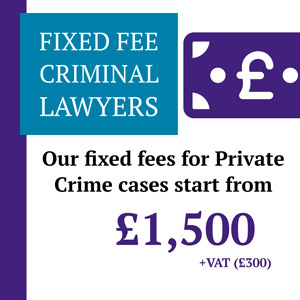 Our Private Legal Defence Lawyers accept new cases on a Fixed Fee basis, ensuring that our clients know exactly how much their case will cost from the outset. Private legal representation is not only reserved for the very wealthy, many of our clients are also ordinary people that require a robust defence team to provide them with the best chance of protecting their reputation and career. If you require more information on the cost of defending your case, speak to one of our solicitors for a free no obligation fee estimate. We have been covering only private client criminal cases for many years and the benefits for our clients are very clear. Our clients receive a much higher level of legal expertise and attention, because they are funding their cases privately. This enables us to dedicate more time in preparing the case, compared with firms that may also offer legal aid. Legal aid lawyers (Duty Solicitors) are often over-worked and are covering more cases than they should, as the nature of their work is not profitable, and this can result in your case not receiving the time and attention it deserves. Our private client solicitors are specialists in their field, have significant experience and will have dealt with other cases like yours in the past and will know the best strategies to achieve a not guilty verdict. Our top-rated criminal defence team understand that being prosecuted will have a devastating impact upon your career, future income and your professional profile and for that reason we leave no stone unturned when it comes to scrutinising the evidence and planning a strong defence strategy. We appreciate that for many white-collar workers and regulated professionals a conviction for a crime could result in a professional regulatory body such as the Solicitors Regulation Authority, General Medical Council or Financial Conduct Authority assessing whether you remain suitable to continue in your profession given the criminal conviction on your record. We aim to secure the best possible outcome for all our clients, as a conviction could result in life changing consequences or prevent you from continuing your chosen career path. It is important to appreciate that a relatively minor conviction, such as common assault, may not result in a custodial sentence (prison), however, a conviction could potentially result in the end of your career or issues with other aspects of your life, such as travelling to other countries for holidays or work. Our lawyers understand that being prosecuted is a tough time and your case is a priority for us. Instructing our specialist top ranked criminal lawyers to represent you will give you the best possible chance of a successful outcome and we will fight your corner to win. Our solicitors appreciate that if you are a public figure or sports personality, a criminal conviction or even investigation could potentially result in suspension from public office or cancellation of sponsorship / advertising deals. It is, therefore, crucial that you instruct a qualified and experienced criminal defence law firm that has previously represented many high-profile clients and professionals, as this will provide you with the best chance of a not guilty verdict. A criminal record for an offence such as assault, battery or harassment could also cause difficulties in family law / care proceedings as a criminal conviction will create a further obstacle to overcome in those proceedings. The lawyer you choose to instruct to defend your case will have a significant impact upon the direction and outcome of the case, therefore you should take serious consideration when choosing the law firm. To contact one of our specialist private crime lawyers, phone us on 0345 222 9955 for an initial telephone case assessment and a no obligation fixed fee quotation or fill out our contact form and we will get back to you. Expertise: There are very limited number of law firms throughout the country that only accept criminal cases on a private fee-paying basis, these lawyers will usually only accept such cases because they possess superior legal knowledge and expertise, which understandably comes at a premium. Communication: Paying for legal representation privately will usually result in better and more frequent communication with your Solicitor and Barrister. Lawyers paid privately will usually respond to e-mails and phone calls quickly. Preparation: The amount of time a lawyer spends preparing a case and considering the evidence will have an impact upon the result. Paying privately will ensure that the lawyer can spend ample time on case preparation, which will have a positive impact on the overall outcome of the case. We prepare thoroughly for each case. Service: Clients that instruct lawyers via private funds will receive a substantially better service than those using legal aid. Quality: The overall quality of legal representation from private client solicitors is significantly superior. Consistency: We provide all our clients with consistency and continuity, the lawyer dealing with your case will be the same person from start to finish. If you are a regulated professional, a criminal conviction could cause difficulties in your chosen profession. Our specialist lawyers understand the implications a Police Caution or Criminal Conviction could have. We represent the full range of clients from ordinary people, through to high-net worth individuals, sports personalities and actors. We are instructed by individuals that are in a financial position to pay privately for legal representation and those that appreciate the benefits of doing this, as opposed to using public funding. In certain circumstances, if the police are investigating a criminal allegation, they may invite you to attend a ‘Voluntary Police Interview Under Caution’ as an alternative to placing you under arrest. If you have been invited to a ‘Voluntary Interview’ at the Police Station, it is important to note that this is not simply ‘a chat with the police’ it will be a formal recorded interview, you will be placed under caution and the evidence gathered at the interview, will be used as part of the prosecution case, if you are charged. It is vital that you make arrangements and secure legal representation well in advance of attending the Police Interview. The interview is a very important part of a criminal case, and the foundation of a defence should be established during the interview and for that reason it is crucial that you are legally represented at the Police Station. If you have been called to attend a formal interview under caution, please contact us on 03452229955 and one of our lawyers will be able to provide you with a Fixed Fee for representing you at the Police Station. Our lawyers have successfully advised and represented suspects at the Police Station, which has subsequently resulted in the police case being discontinued. Seeking specialist legal advice from a qualified solicitor from the outset will ensure that your defence is properly formed, should you be charged and may even result in the Police / CPS taking a decision not to prosecute due to the representations made by the lawyer. When Should You Contact Our Specialist Criminal Solicitors? If you are suspected of committing a crime, have been asked to attend the police station or have recently been charged, please contact us as soon as possible. Seeking legal advice at an early stage will significantly increase the prospects of a successful outcome and will ensure that your defence is properly established from the outset. Contacting us at an early stage of the investigation or immediately after charge will enable us to advise you of the cost of representation, how you ought to plead and the options available to you. What Will Happen When You Contact Us? When you call us regarding your case, you will be transferred to one of our Qualified Private Criminal Defence Solicitors and we will take some initial details regarding the allegation made against you. Once we have a basic understanding of the allegation, and your version of events we will be able to provide you with our initial thoughts on the options available to you and how we can assist. We will also provide you with an indication of the likely cost to defend your case and will provide you with a fixed fee for appointing us as your legal team. As such matters can be life changing, we cannot provide any detailed advice on how you should plead, and the strength of your case during the initial phone call. Detailed advice will be provided once we are formally instructed as your lawyers and once we have considered the evidence in the case. How Much Will a Private Solicitor Cost Me? Each client, and each case is individual and different, for that reason there are no set fees for our cases, because the cost will be determined by the number of offences, the nature of the offence and the evidence in the case. If you are interested in appointing us as your lawyers, please call us and we can provide you with an estimate on the cost to take your case to trial. Our fees for representation at the First Magistrates’ Court Hearing start from £1,500+VAT and this will include a meeting with one of our lawyers, initial detailed legal advice and representation at the Magistrates’ Court. Once you have spoken with us and been given an initial case assessment and fee for representation at the First Magistrates’ Court Hearing, if you wish to proceed with formally appointing us, please notify us as soon as possible. A Fixed Fee invoice will be e-mailed to you and full payment of the invoice will need to be made via BACS or online transfer. Once we have received payment of the fee, a file will be opened, and an appointment will be booked for you to meet us at our offices in Birmingham, Milton Keynes or London in person so that we can discuss the allegation with you and provide you with detailed initial advice. Our Private Client Criminal Litigation team work diligently with you every step of the way to ensure the best possible defence is presented at each stage of the case. We are very skilled in the Criminal Justice System, legislation and the latest case law. We invest that knowledge, along with the skills and experience of leading Barristers to the specific facts of your prosecution and build a robust defence case, providing you with the best prospects of success. As a bespoke legal defence law firm, we have a wealth of knowledge and experience, representing clients both in the Magistrates’ and Crown Court. Our lawyers are defending clients in Courts across the country daily and have significant experience in Court procedure and advocacy. If you are acquitted after trial (found Not Guilty) our lawyers can apply to the Court for a Defence Costs Order and this will mean that you will be able to recover some of the cost of instructing us to defend your case at trial. If you would like more information on this, please call one of our lawyers on 03452229955. As a Specialist National Law Firm with offices in Birmingham, Milton Keynes and London we can be appointed to defend your case throughout England and Wales. We regularly represent clients in Wolverhampton, Coventry, Northampton, Birmingham, London, Milton Keynes, Stafford, Leicester, Nottingham and Leamington Spa.